Venison Wellington makes a fantastic centrepiece for a dinner party. It is not, as is often assumed, an invention for that famous Duke’s epic victory, but rather so named because the criss-crossed golden pastry resembles a Wellington boot. This version doesn’t require you to plait the pastry, but simply roll it – for individuals, plaiting could be fiddly. However, the pastry casing still helps keep the venison lovely and moist. I use the saddle fillets of muntjac, but you can also use the saddle fillets of roe deer – it will just take slightly longer to cook. Make sure you have trimmed all the sinew from the outside of your muntjac fillets and cut each fillet in half to give you 4 portions. Seal them in a frying pan on a high heat with a drizzle of rapeseed oil. Once browned, remove from the heat and leave to cool completely. Fry your pancetta lardons until golden brown and then lie the spinach over the cooked lardons, cover with a lid and allow to wilt over a low heat. Once the spinach has wilted, place the spinach and lardons into a cold bowl and allow to cool down completely. This is very important, otherwise the steam from the food will turn your pastry soggy. Roll out your puff pastry into a long narrow rectangle, wide enough to cover the length of the venison pieces. Slice the pastry across its width into four pieces. Place one venison fillet into a pastry rectangle, add a spoonful of the spinach and lardon mixture on top of the fillet. Brush the edges of the pastry with an egg wash and roll the loin, lardon and spinach mixture up in the pastry, making sure you tuck the ends under. Place on baking tray, brush the top with egg wash and then do the same with the other 3 fillets. Put in a preheated oven at 180 degrees C for 15-20 minutes, until the pastry looks golden brown on the outside. Sweat the finely sliced shallots in a pan with some butter until they are clear. Add sliced mushrooms, put the lid on and let them sweat in the buttery onions. After about 10 minutes, add salt and pepper to season. Just before serving, add 3 tablespoons of creme fraiche and a dash of brandy and serve this in a jug. 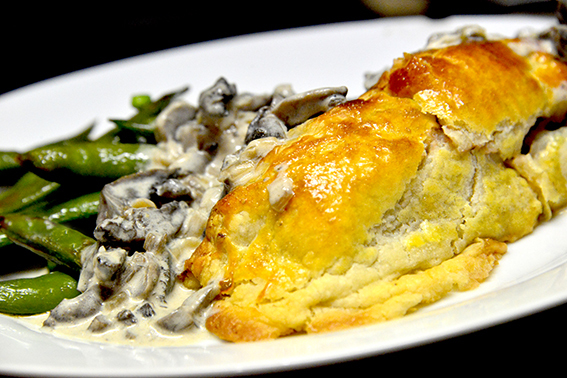 We love accompanying this Venison Wellington and Mushroom Sauce with steamed mange tout, but any veg will do! Your local butcher will be able to get this for you – if you give them a ring they will make sure they order some in from the game dealer. I can’t wait to give this a try! I am always looking for new recipes for venison and elk. I have made deer steaks with herbs and cheese on top, which is delicious, but this sounds fantastic. I can’t wait to look around more on your site!